This year NewscastStudio turns 15 years old. For me, it’s hard to believe that this “weekend project” that started on a whim has grown to become one of the television industry’s largest sites and now has become my full time job. Starting this week, and continuing until NewscastStudio’s “official” birthday April 15, 2018, we’ll be taking a quick look at the site’s 15 years — in a year-by-year format. 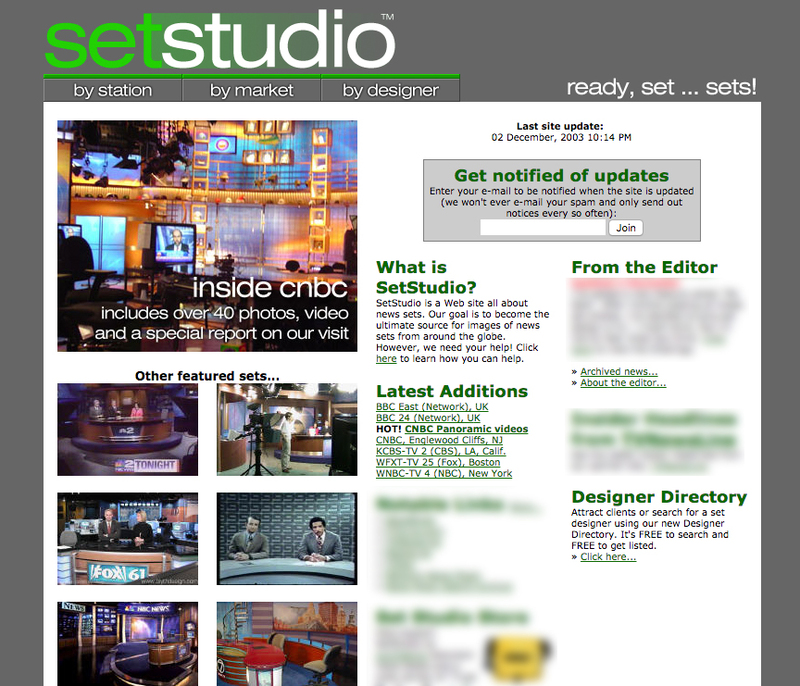 Back in 2003 the site was going under its original name — SetStudio — and had a distinctly different look and feel. Here’s a look at how NewscastStudio appeared for much of that first year. The format changed a few times, but the general look was the same — dark gray background, a white box and bright green accent color. Evidence of the lowercase style is also visible in the headlines that were added via Photoshop atop photos, most notably in the “main” photo on the homepage. This design made heavy use of Verdana, a popular typeface at a time before more advanced typography options were available to web designers. In addition to the logo, the header also features the somewhat corny tagline “Ready, set … sets” (again in all lowercase letters) and three tabs capped with thin green bevels that divided the site into what were our three primary sorting functions at the time — by station, by market and by designer. I still have memories of how tedious this design was to update via Microsoft FrontPage (don’t judge me). Adding a new gallery was a bit tedious as it required copying a template, manually creating a new directory and then importing all of the images. FrontPage, at the time, featured an “auto thumbnail” feature (good old Control+T) that did make it easier to build galleries. Next, the various lists of sets had to be manually updated — along with the homepage imagery and “latest” boxes. 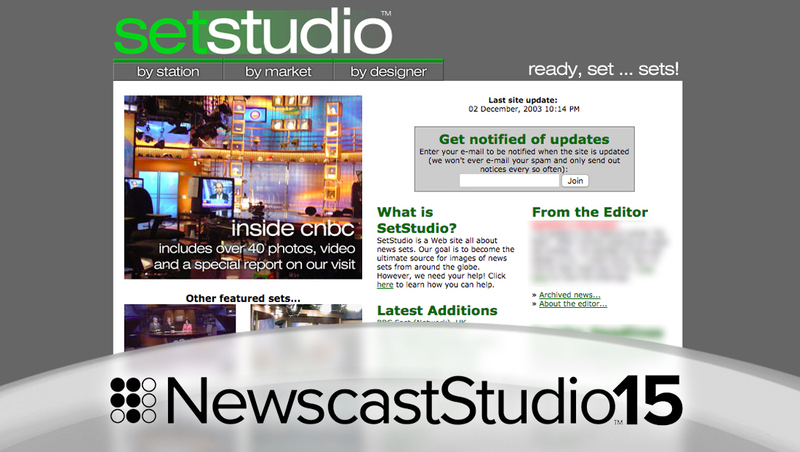 As the years went on, SetStudio and, later, NewscastStudio began using technologies that let galleries and pages become dynamically generated, though it’s sometimes fun to think back at how much the site’s architecture has advanced since then.